Let's face it. Ladies can be just as tough to shop for as guys! After creating my list of great gift ideas for guys, I was inspired to put together a list of great gift ideas for women, too! Don't let gift shopping for your special lady get you down. Scroll down for a little #giftspiration from yours truly. Hopefully, you'll find that special something that's perfect for the special someone in your life! Knowing what to get your lady can be tough, but not if you spend a little time getting to know her. Pay attention to the details, the day-to-day. Notice the things she uses often. Find out what she likes simply by paying attention. There's no sense in trying to get super creative, especially if you're uninspired. Save those spontaneous creative sparks for extra special events, birthdays, or holidays. Look around her space; is she low on perfume? Did she recently lose a favorite piece of jewelry? Or maybe she needs a pair or earrings to complete a bracelet & necklace set? Are the straps on her favorite bag worn and frayed? Replacing or refreshing a favorite item is a great way to show her that you're paying attention to her style and her needs. Some ladies aren't into material things like accessories, clothes, and shoes. If that sounds like your gal, consider purchasing her something useful like a new kitchen appliance or long-lasting cookware (LeCrueset anyone?). And if she's into fitness, an ongoing subscription to a fitness wear program might be the perfect gift! Whatever she likes, run with it! If you're in need of something extra special, consider a large purchase. Maybe a nice new camera? Fancy sunglasses she's been eyeing? Or a total splurge piece like a piece of furniture! Whatever it is, make sure it's something she will use and would never purchase herself! Ladies (at least most of them) love jewelry. I know I do! There's no better time to give your girl a piece of fine jewelry than special occassions such as holidays, birthdays, or anniversaries. Now, fellas, don't get all bent out of shape over jewelry. Putting a ring on it doesn't have to mean marriage, especially if you haven't been together long. Show her you're serious about her without the commitment of a rock with a shiny piece of statement jewelry. This year, petite pieces like those you see below are all the rage. I bet she'll love any one of these! Perfume is always a great gift idea for women. Whether the lady in your life likes sweet, floral, or woodsy scents, there's a perfume for every woman. You can't go wrong with any of these great perfumes gifts! Every woman deserves something cuddly and soft, but puppies aren't always an option. So, give her the next best thing with a comfy, cozy sweater. There's nothing better than snuggling into a warm, soft sweater on cool days. She'll feel your love wrapped around her every time she wears any one of these sweet threads. Will You Take Coffee or Tea, M'Lady? 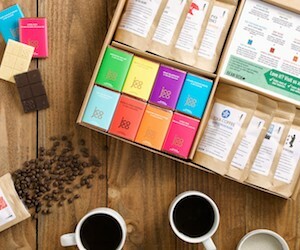 Give her the gift of delicious, freshly roasted coffee beans in her mailbox each month with a subscription to Bean Box. 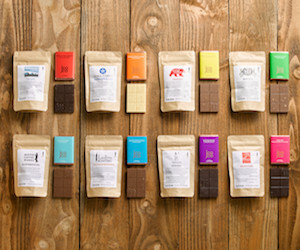 Curated based on her tastes, boxes are full of artisanal coffee beans from Seattle's best roasters. 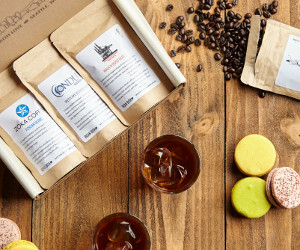 Choose between the Bean Box sampler which includes 4 roasts to try (1.8oz each) or the Coffee of the Month option (12oz each). She'll savor every last drop from her daily cup of ambition! If tea can soothe your lady's soul, then why not give her a great tea sampler set from The Art of Tea. Choose from several different sampler sets, including the elegant set pictured below. With teas from around the world, The Art of Tea will keep the tea-lover in your life satisfied and soothed. Fun loving ladies will absolutely adore any of the colorful socks from Happy Socks. Made of high-grade woven cotton, these socks are stylish and silly all at once. Each pair is dyed by hand and features creative designs and vivid colors sure to speak to her inner child. Got a tender-hearted, do-gooder on your list? Give her the gift that gives back when you give her Love with Food. She's sure to appreciate how this unique snack subscription service is doing it's part to feed hungry children. For each shipment she gets, a hungry child will receive a much needed meal. Boxes are filled with nutritious snacks that she'll love, too. Memberships start as low as $7.99 per month. These organic, all-natural or gluten-free snacks help her stay hungry while giving back. Fun, funky workout gear is perfect for the lady in your life that loves working on her fitness. She'll turn heads in any one of the trendy styles from Fabletics. This innovative new workout wear company makes it easy to stay stylish in the gym. Ladies can sign up for monthly shipments of pre-selected tops, tanks, and leggings. Or they can shop for single pieces that fit their needs. A Fabletics gift card is a great place to start if you're unsure what to buy. If your lady likes to stay organized, then she'll absolutely love any of the amazing planners, journals, or scrapbooks from Emily Ley Paper Products. If she's not that into planning, get her something cute and sassy from Ashley Brooke Designs. Every woman needs help staying motivated and organized, so any of these stylish products are sure to please. Check out my favorites below! Is your lady a life-long learner? If you answered "yes" to that question then you've only one choice when it comes to gift giving. 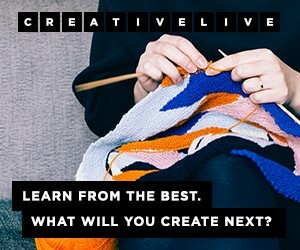 She'll love a gift certificate from Creative Live, an online education resource perfect for creative ladies wanting to grow and learn. Choose from classes in photography, crafts, art, design, business, entrepreneurship, money management and more. Give her the gift of knowledge this year! When life gets to be too much we tend to compromise on meal prep and healthy eating. Help the wonder woman in your life stay healthy and less stressed by enrolling in Sun Basket, a new subscription service that ships farm-fresh ingredients straight to her door once a week. The weekly meal plans, easy-to-prepare recipes and seasonal ingredients takes the stress out of dinner night after night. Meals start as low as $11.49 each for 2 or 3 people. Chances are you're spending just as much every week in the market! 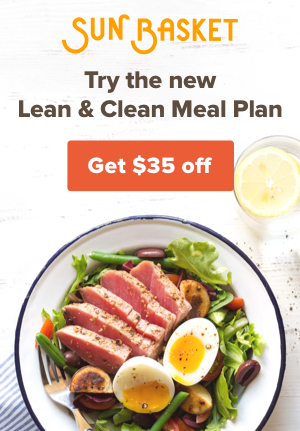 Use this link and get your first 3 meals FREE! Add an insulated lunch bag or shaker from Fit & Fresh, and you're lady will be fit as a fiddle. Don't send her to work with a plain old sack lunch! Get her a stylish insulated tote from Fit & Fresh. Juicing is all the rage right now, so chances are your lady's been spending a ton of cold hard cash on cold pressed juice. Do her a favor and buy her a juicer! Read all about my juicing adventure before buying one! Every lady loves a stylish home, so suprising your lady with an interior design consultation from Havenly. This innovative service puts designers and decorators at your service for a fraction of the cost of other design services. And if you're in the market for stylish home goods, take a peak at my picks below! Give your fashionista something to brag about with any of these trendy, yet classic handbags. She'll sure to turn heads with a fine leather bag, and, best of all, every time she's asked about her bag she gets to brag about you! So, go ahead, give her something to brag about! Hopefully this list of great gift ideas for women of all ages has helped you check off a few special ladies from your shopping list. Feel free to share this list with friends and family who might need a little inspiration for their gift giving. Got a few guys on your list, too? If so, don't miss my list of great gift ideas for guys of all ages. I've even got a list of gift ideas for travelers that can help you hone in on the right present for the wanderer in your life. If you liked this post then be sure to sign up for my newsletter. You'll receive weekly updates when new posts are created and bi-monthly emails from yours truly! Get all the behind the scenes info and stay in-the-know about new adventures and partnerships on the horizon.